Pues vas geniaaal!!! 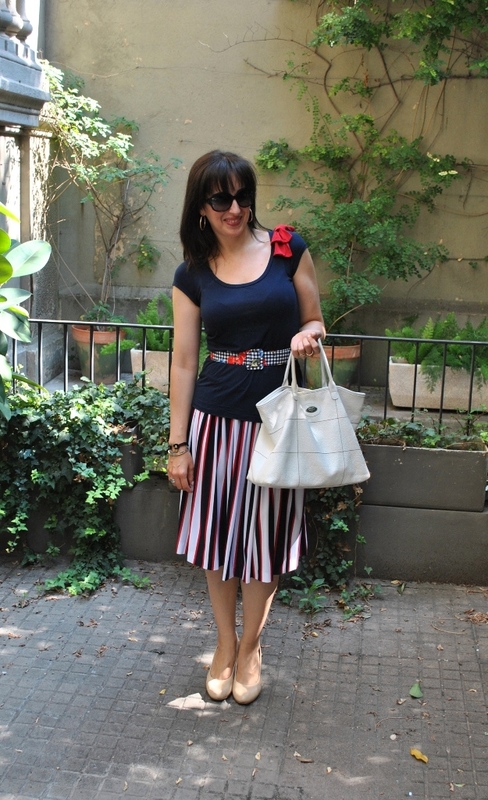 me encanta el conjunto!! la falda es una moneriaa!!! Pasate por mi blog!! Un beso!! Estas genial! Que preciosidad de falda! Tienes mucha razón, que buena combinación. Me encanta la falda y tengo la misma pulserita pero en rosa, jeje, me encanta. I love red, white and blue worn together as well! I'm following you now on GFC and Bloglovin'! very pretty, the bow on the shirt makes the outfit! Love this skirt! Following you! what a great combination - love the match of this skirt and this top! Always so elegant! You look great - love the skirt! Me encanta la falda...!! es DIY?? la combinacion de colores queda muy bien! Soy Sonia, acabo de conocer tu blog, y como me ha gustado me he hecho seguidora... te invito a que pases por el mio y me des tu opinion... y si te gusta... pues nos seguimos!! Estas preciosa con este look!!! Que guapa! me encanta la falda! This def has a patriotic theme in the US, and I love the bows on your shoulder. I love the bzero5 collection from Bvlgari. cute outfit, you look great in it! Sure, I followed you back ,dear! !